The powerful and addictive desktop column game for Windows. The three-block column is created one by one randomly, and you have to place each carefully in order to form a horizontal line, vertical line, left diagonal line (/) or right diagonal line (\) to clear. Game speed will also become faster as level is increasing and there is VERY little time for you to consider the position of each column and you will have to think, act and move very fast! Super Columns, the powerful and addictive desktop column game for Windows. 1. Skinnable Interface: Super Columns is skinnable. It currently has two beautiful skins with the theme of True Love! 2. Two additional Game Mode: Besides Double Player Standard Game, there are two more addictive game modes for double players: Battle Game & Cooperation Game! 3. 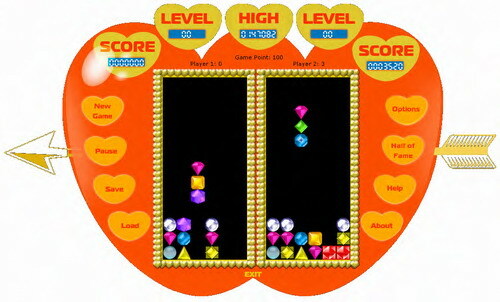 Magic Block: Super Columns firstly introduce Magic Block, which can also be called Swap Block. It has a "+" in the center of each block, and once you see that, you can press the Swap key to swap current block to the block you need. 4. Any Size of Play Area: One of greatest feature of Super Columns is that the play area of Super Columns is not restricted! You may select four preset sizes among 13x6(Standard), 16x9(Contest Size), 19x12(Play longer) and 10x5(Challenging! ), Full Screen and you may also customize the play area by yourself! The powerful and addictive desktop column game for Windows. SuperClip is a tool which copies previous inserted text into the clipboard. In a second you will be dragged into pure action and thrilling adventure! SuperText is an enhanced ActiveX text box that includes several new properties. Super Cubes is a great new colorful and addictive puzzle game. All these sports cars stand for the super speed. Screensaver with SuperHeroes dancing over your screen. Super DVD Factory is a DVD creator tool for creating DVD-videos form video files. Qweas is providing links to Super Columns 1.20 as a courtesy, and makes no representations regarding Super Columns or any other applications or any information related thereto. Any questions, complaints or claims regarding this application Super Columns 1.20 must be directed to the appropriate software vendor. You may click the publisher link of Super Columns on the top of this page to get more details about the vendor.